Reduced sinus pathways and chronic sinus inflammation can lead to uncomfortable side effects, including headaches, tenderness, and more serious health complications. If previous medical treatments or traditional sinus surgery have not reduced your symptoms, Dr. Michael S. Cohen can perform an endoscopic sinus surgery. This minimally invasive alternative to traditional surgery expedites recovery and reduces discomfort. Even better, according to the American Academy of Family Physicians, endoscopic sinus surgery has a high success rate of 80 to 90 percent. Many doctors refer advanced cases to Dr. Cohen because he specializes in endoscopic sinus surgery and can coordinate with other specialists to provide you with the most comprehensive treatment available. He almost always performs treatment at an outpatient surgery center near his Long Island, NY, office so you get the treatment you need in a safe and comfortable setting. 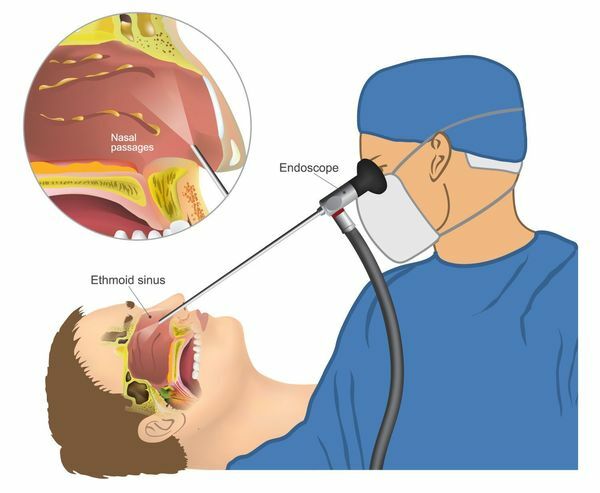 Endoscopy allows your surgeon to visualize the internal structures of your nose without creating incisions. Could You Benefit from This Surgery? There are several reasons why Dr. Cohen might recommend this surgery as a treatment option. The most common is to reduce the symptoms of long-term or chronic sinusitis. In many cases, this type of persistent inflammation is linked to nasal polyps, allergies, and other problematic symptoms. However, patients should keep in mind that the goal of surgery is not to cure sinusitis, but to complement the effects of other therapies and reduce the occurrence of inflammation. Ideally, the procedure will improve the drainage of your sinuses by widening the pathways so that you can both breathe and apply medication more easily. To plan your surgery, Dr. Cohen may order a computed tomography scan to visually assess your sinuses. With this information, he can create a detailed surgical plan to ensure the least impact upon your nasal tissue. Dr. Cohen and his staff will provide additional pre-op instructions to ensure that you feel comfortable upon arriving for your procedure. In the days before surgery, it is particularly important that you refrain from taking any medications such as aspirin and ibuprofen which can increase bleeding. For most patients, the procedure lasts approximately 30 to 90 minutes. Rather than make incisions, Dr. Cohen will insert a thin, fiber-optic camera known as a nasal endoscope through the nostrils. This device allows him to view the insides of your nasal tissue and sinuses and determine which areas to treat. According to the American Academy of Family Physicians, endoscopic sinus surgery has a high success rate of 80 to 90 percent. After identifying the problematic channels, Dr. Cohen will typically enlarge the pathways by shrinking tissue and potentially correcting a deviated septum in the process. Thanks to the advanced tools and technology available, most patients experience minimal discomfort and side effects in the days after their appointment. Many patients report a reduction in sinus infections and improvement of symptoms following this surgery. However, to ensure the success of your treatment, it is important that you closely follow the instructions provided by Dr. Cohen. Dr. Cohen performs this outpatient procedure at an ambulatory surgery center to ensure that patients have access to the care, technology, and resources they need. To schedule a consultation or learn more about your treatment options, call our office at (516) 921-6780 or contact our team online.